Working with small letters can be frustrating. Chances are that you think your small lettering looks distorted, bunchy or just plain amateurish. The truth is, is probably not your fault. That’s right. Your good technique can only go as far as the data allows. In other words, if the font isn’t suitable for the size, probably nothing you do can make it look great. Small lettering should be digitized to minimize bulk in corners and with a certain flow to allow the stitches to be laid in smoothly and cleanly. A font that will stitch well in very small sizes usually indicates this quality in its name. For example, you may have fonts in your software with a name that indicates they were designed for a small letter size, such as “Small Century” or “5mm Block”. In this example we have two digitized letters created in a popular home embroidery software program. 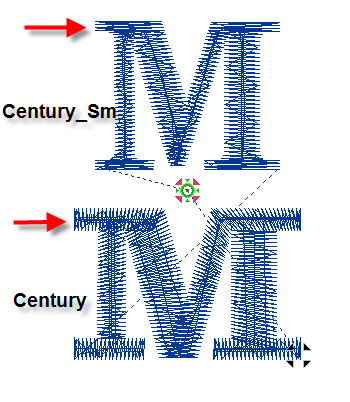 The top letter, labeled “Century_Sm”, was made for small letter sizes. Notice that the extensions, called “serifs”, are stitched in the same direction as the body of the letter. The bottom letter, labeled “Century” was made from a font digitized for larger letter sizes. In this letter, the serifs are stitched in a vertical direction because the stitch would become too long if stitched in the same direction as the body, resulting in a loose, sloppy serif. Look in your software and see if you can identify some fonts made for specific sizes or size ranges. Even if they aren’t your favorites, you could see a big difference in quality in your small lettering. 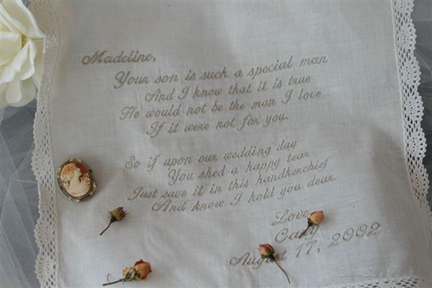 This wedding handkerchief is a fine example of high quality small script lettering. This version of the Diana font doesn't close up on the in the centers of letters. The lettering was also created with a .50 density - light but appropriate for this small 10mm letter size.